Matthew Hayes, a senior with a major in Architecture and Concentration in Furniture Design, traveled on a Break Travel and Research Grant from the Nanovic Institute to compile research for his senior thesis. He went to a monastery in Belgium this fall to research a design proposal for a monastery and brewery in upstate New York. Studying photographs and drawings of buildings is incredibly valuable, but analyzing a building in person presents the opportunity to gain a more thorough understanding of its design and construction. One of the key challenges in creating a strong design will be successfully combining a variety of building functions into a cohesive whole while preserving the hierarchy and utility of individual parts. The goal of this research trip was to deepen my understanding of the design principles behind traditional monasteries and breweries and the Flemish gothic vernacular. I planned to accomplish this by studying instances of each firsthand through sketching, photography, and making measured scale drawings. Visiting Belgium gave me numerous opportunities to do so, such as spending two nights at the guest house of Orval Abbey, which includes a brewery and cheese factory. Seeing a commercial brewery seamlessly integrated with a monastery was invaluable, and spending two days there really helped me to familiarize myself with the rhythms of monastic life. 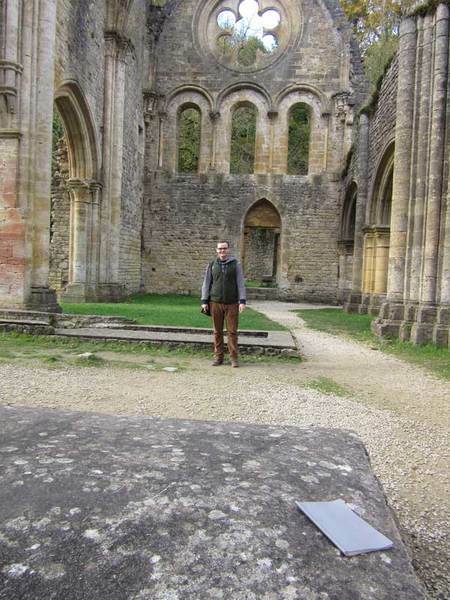 Along with the medieval ruins also present at Orval, Villers Abbey was an appealing destination due to the fact that it is now in ruins, allowing me to study parts of the monastic complex that would be inaccessible if still in use. 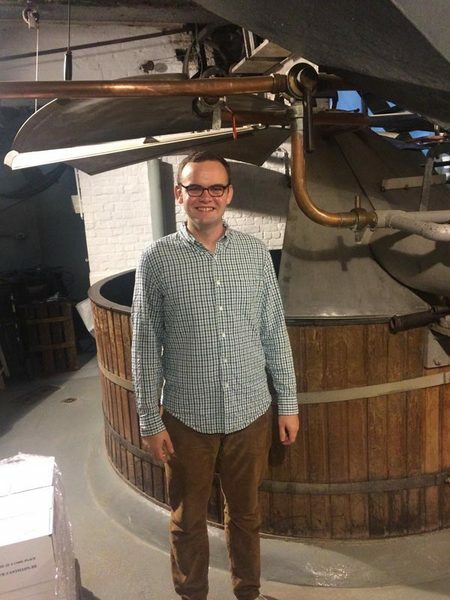 I also visited and documented several historic breweries of middling size that can serve as the precedent for my thesis, such as Cantillion Brewery, Ter Dolen Brewery, De Halve Maan Brewery, and Orval. The last main component of my research was time spent in Bruges studying the Flemish gothic brick construction of both smaller houses and larger structures such as St. John’s Hospital. I was eager to study these in detail to understand their design and construction for techniques I will be able to implement in my thesis. The results of this research will play a main role in steering the design of my thesis project. Studying photographs and drawings of buildings is incredibly valuable, but analyzing a building in person presents the opportunity to gain a more thorough understanding of its design and construction. For example, at the pharmacy of St. John’s Hospital in Bruges, I sketched curved brick door surrounds that added complexity and interest while using only one non-standard brick shape. Traveling to Belgium allowed me to study traditional monastery and brewery architecture in order to identify design elements that will help me successfully address the challenge of combining buildings used for worship, living, and production. Although it will most immediately benefit the design of my thesis, I will also carry the knowledge that I gained researching in Belgium forward into my professional work. From building compositions to brick details, I studied loads of architectural forms and details that I can use as inspiration and precedent in the future. Some of my research in Belgium allowed me to further previous lines of inquiry, namely my interest in load-bearing brick masonry previously investigated with help from grants from the Center for Undergraduate Scholarly Engagement. Studying brick structures in Bruges allowed me to observe how advanced forms can be created with only a few shapes of bricks. Knowledge of these masonry techniques will be useful for both my thesis and professional life. The same can be said for all of the knowledge I gained from my travel to Belgium. I arrived in Brussels early enough that I was able to take a train to Antwerp for part of the day. I had initially had several sites that I hoped to visit in Antwerp, but had to eliminate it from my itinerary due to limited time. With the extra half day I was able to visit the Plantin Moretus Museum. A 16th-century print shop, it was a great opportunity to study an industrial building that combines classical and vernacular tradition. 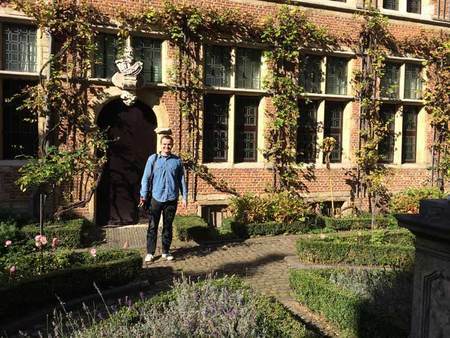 I also visited a beguinage in Antwerp, which was a great opportunity to see a small religious complex with moderately scaled residences rendered in brick; something very similar to what I hope to do for my thesis. The only site that I hoped to visit but was unable to was the Achel brewery, for lack of time. However, the unexpected opportunity to tour the usually-private brewery at Orval more than offset this loss! This trip was another step in my personal growth as a future architect. It was my first time travelling alone for study. I really enjoyed the opportunity to dictate how I engaged with the sites I visited. If something was more relevant to my research than anticipated, I could spend longer sketching it in person. Spending a week doing in-depth on-site study allowed me to hone my documentation skills and further develop the how I think about a building when I am trying to learn from its design and construction.The sketches and photographs that I compiled will be a useful resource for the rest of my career, and creating them helped me to fully appreciate and internalize everything I saw. Originally published by Jennifer Lechtanski at nanovic.nd.edu on February 13, 2018.